If you are still one of the Google PageRank devotees, you may have noticed that your Google PageRank is suddenly showing as not available…. or it will be shortly. Google is removing the publicly shown Google PageRank from being displayed. For some Google toolbar users, the visible PageRank has already been removed, although it may remain active on some while the removal roll out continues. Here is what you see now when you visit CNN with the Google Toolbar enabled in Internet Explorer (screenshots taken late Monday afternoon). The bar is now grey and when you mouseover it, it shows the “No PageRank information available” popup. Here is how the same site looks from another computer that still is showing PageRank. Here is what we know about the removal of PageRank. Even though visible PageRank is being removed from the Google Toolbar, all pages still have PageRank value internally within Google. And yes, Google is still using PageRank internally at Google. Google confirmed this with The SEM Post as well. “Yes, PageRank is still used in our algorithms, among a number of other signals,” a Google Spokesperson confirmed. In fact, it seems there are no changes related to how Google is using PageRank with this removal of public PageRank. So from an SEO perspective, it might be harder to quickly figure out value of sites with legacy PageRank…. but that metric has really been useless for years. 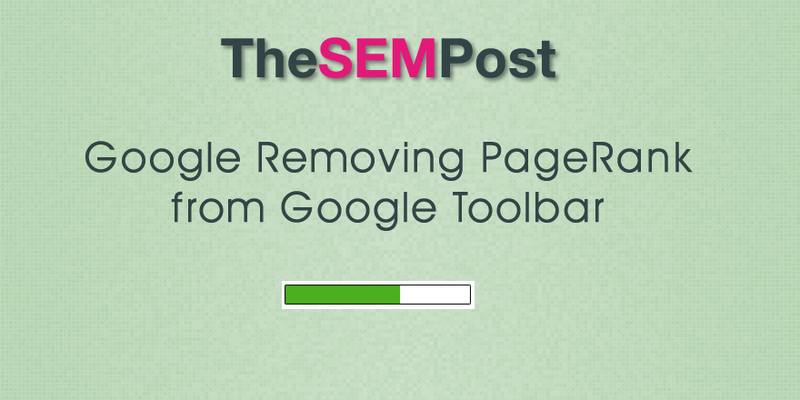 Does Removal of PageRank Change Anything for SEOs or Site Owners? I asked Google this question specifically, and if the removal was simply so SEOs will no longer focus on a metric that hasn’t been updated in years and that we hadn’t expected to see update again. At the end of the day, it really only matters if this removal of legacy PageRank from public view has any impact on sites. Google confirmed it does not. No, this update does not change anything for webmasters or SEOs in how their sites show up in search. Webmasters can use Search Console to get details about their content’s presence in Google Search, including information about links pointing to their sites. As the Internet and our understanding of the Internet have grown in complexity, the Toolbar PageRank score has become less useful to users as a single isolated metric. Retiring the PageRank display from Toolbar helps avoid confusing users and webmasters about the significance of the metric. There are many tools, extensions and toolbars that are designed to show toolbar data as part of the toolset. But since these also pull from public PageRank data, it is believed that these tools will stop working soon. Why Remove PageRank from the Toolbar? Many webmasters have been resigned to the fact that the surprise 2013 PageRank update would be the last – and even that one was an unexpected update after Google fixed another issue that resulted in the update. It also solves the problem that many sites were seeing when they switched from http to https… they were losing their legacy PageRank from http, since it would not transfer over to the https URL. And yes, some site owners were citing “loss of PageRank” – even though it was actually only the visible PageRank – as a reason to not switch sites to the secure https. It also puts less value on pages for link sellers who are still selling links based on what PR value they are. With PageRank gone, that valuable metric will no longer be able to be used by sellers. And there are still endless SEO tips being given out based on the outdated public PageRank, showing that a metric years old still has considerable influence, albeit much of it due to misunderstanding of what PageRank is, why it is important and what the visbible PageRank actually means. So if you want to say a fond farewell to Google Toolbar PageRank before it rides off into the sunset, fire up that old dusty copy of Internet Explorer or use one of the tools/extensions that still display PageRank.